I’m usually not a big Valentine’s Day person, and I guess I’m still not really, but I’m definitely feeling the Valentine’s crafts this year! They are just too cute, and there are too many possibilities, to ignore them out of hand. 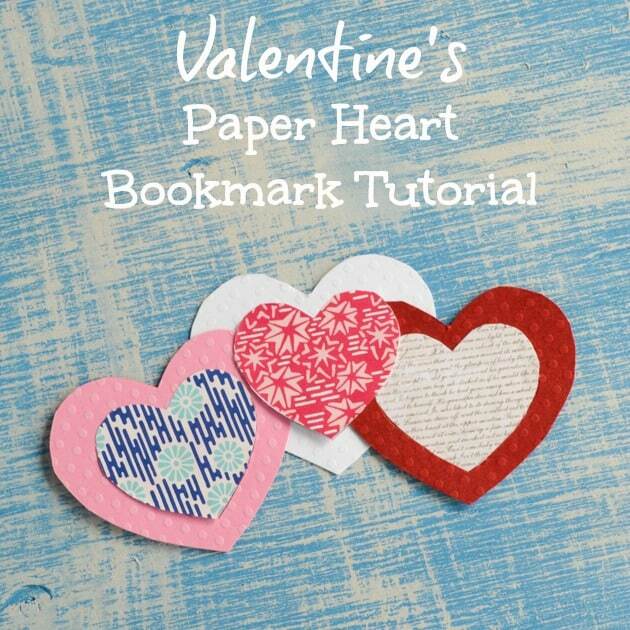 Today’s tutorial is for easy to make paper heart bookmarks. 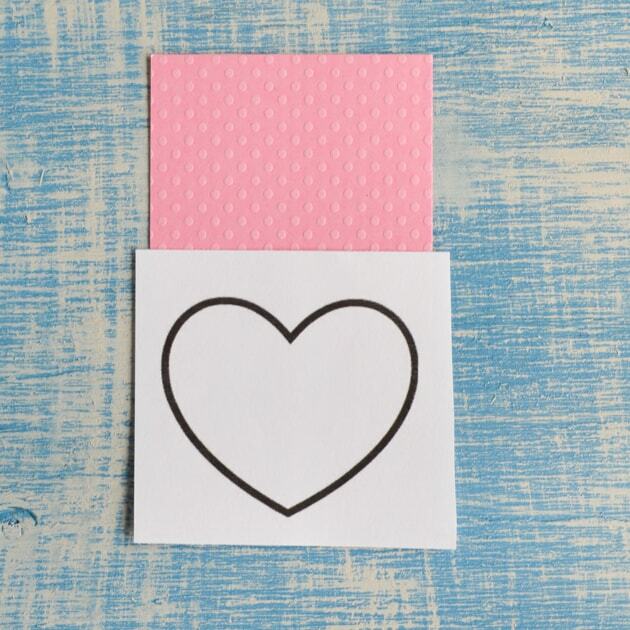 They’re extra easy to make because I already created two perfectly-sized heart templates that you can print out and use! Plus, this project is a great stash-buster if you’ve collected a little too much paper and a fun way to use up scraps of paper too cool to let go of but too small to really use. (Or am I the only one with that problem? It happens a lot with fabric, too). 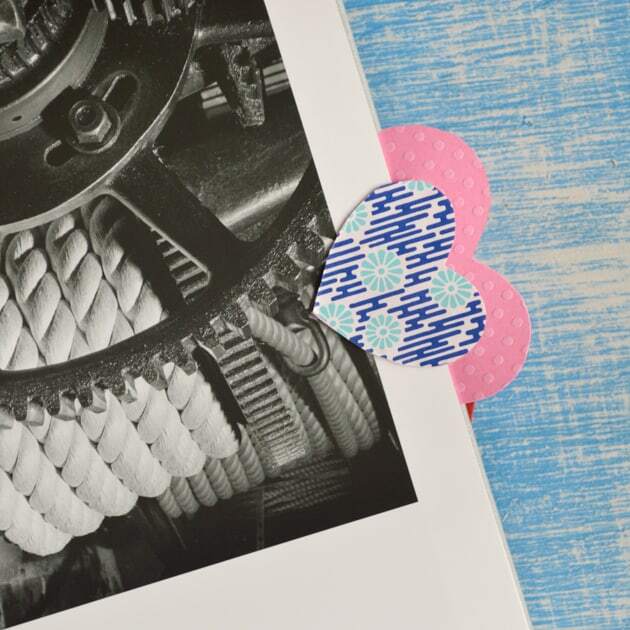 The heart shape is absolutely perfect for this double-layer bookmarks, and the only ‘specialized’ equipment you’ll need is a hobby knife and a cutting mat. Other than that, you’ll mostly need paper and a pair of scissors! 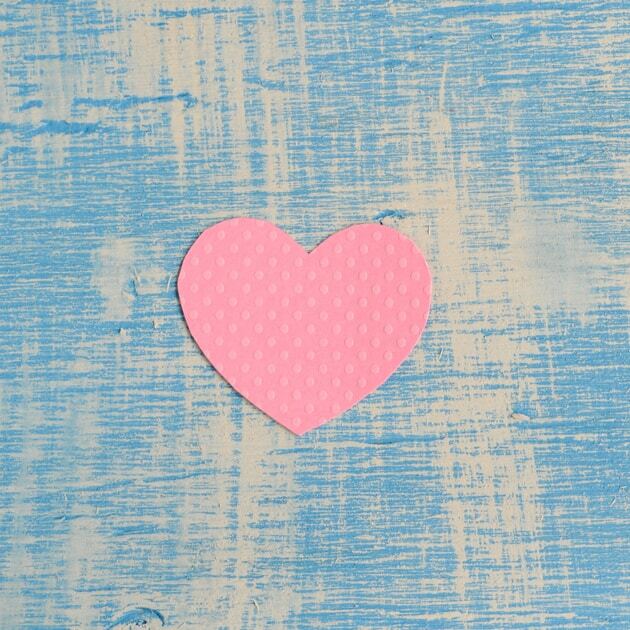 You’ll also need some cardstock or heavy scrapbooking paper for the larger heart and decorative paper for the smaller heart. This paper can be heavyweight, but doesn’t need to be. 1. 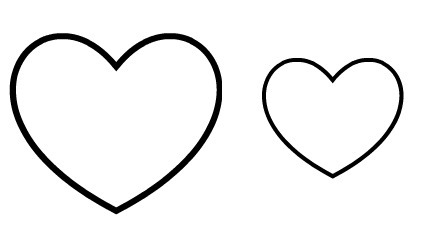 Print out the heart templates or draw your own. I find it’s actually easiest to not cut them out fully at first, sort of like using a sewing pattern. Cut them out roughly the first time and you can simply cut out the template while cutting through your first pieces of paper! 2. 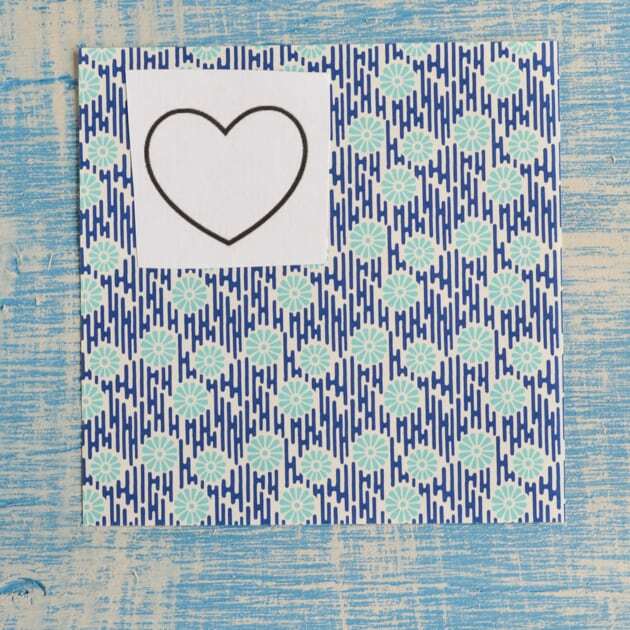 Hold the larger heart template in place against a piece of cardstock or scrapbook paper and out a larger sized heart. 3. 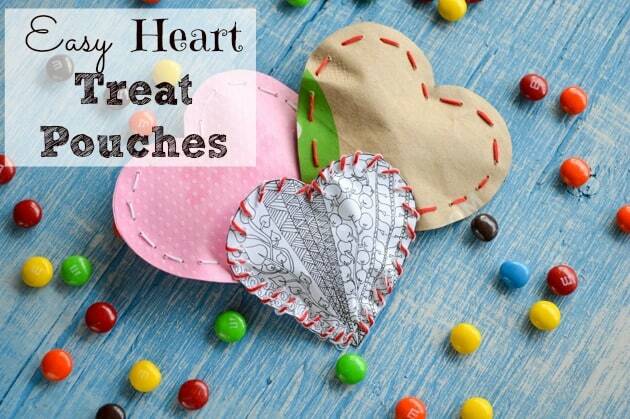 Hold the smaller heart template against one of your decorative sheets of paper and cut out a smaller heart. 4. 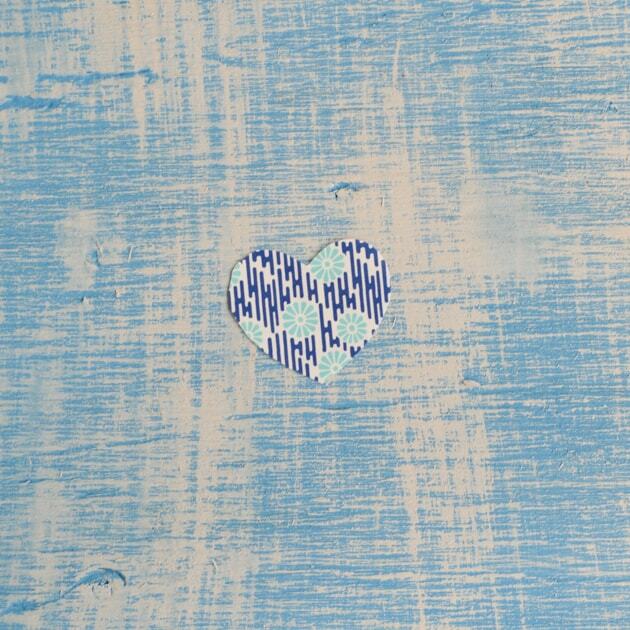 Glue the smaller heart in the center of the larger heart, as shown below. 5. 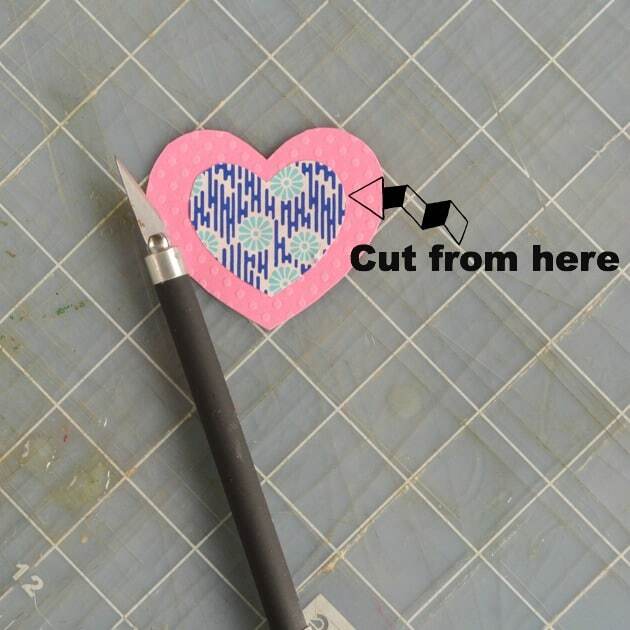 Place the glued hearts on the cutting mat and, using your hobby knife, carefully cut around the bottom edge of the smaller heart. 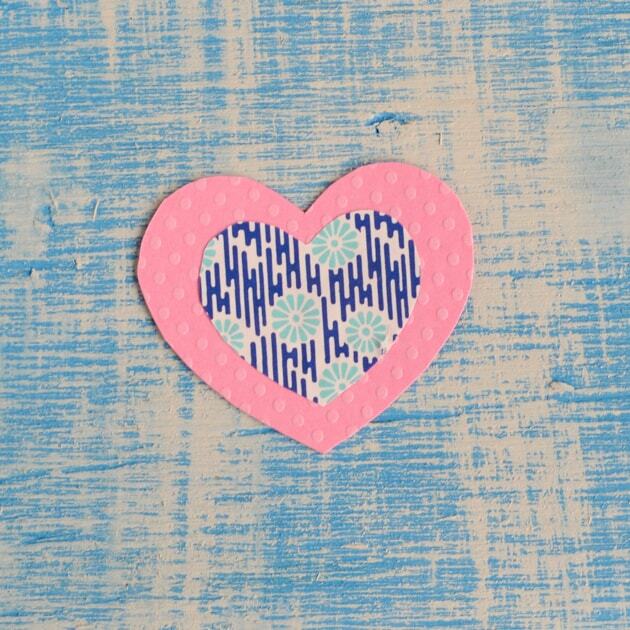 Cut as close to the edge as you can without actually cutting the decorative paper heart. Additionally, the bookmarks work best if you cut all the way from where the upper lobes start to curve in at the top, where the arrow is on the picture below. 6. Check your bookmark on a book and make the cuts longer, if necessary. 7. Repeat steps 1-6 as many times as you’d like! 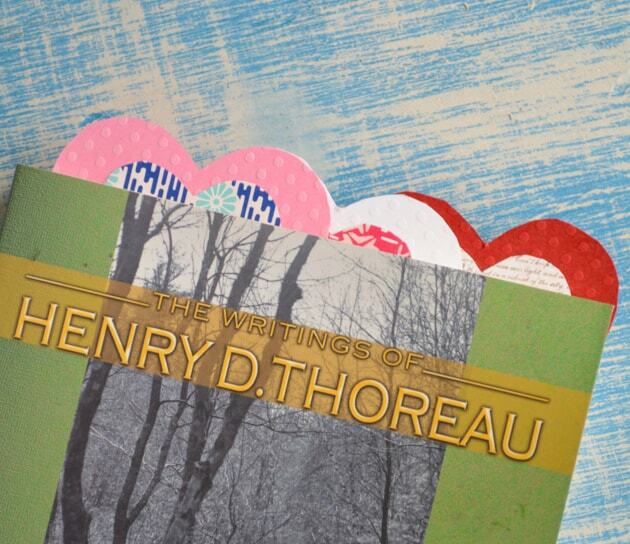 Wouldn’t a book page make a great smaller heart for the bibliophile in your life? 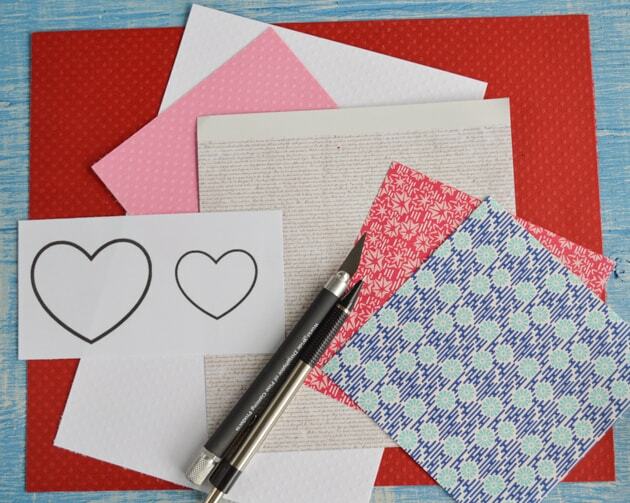 Or how about using your own artwork instead of pre-decorated paper? 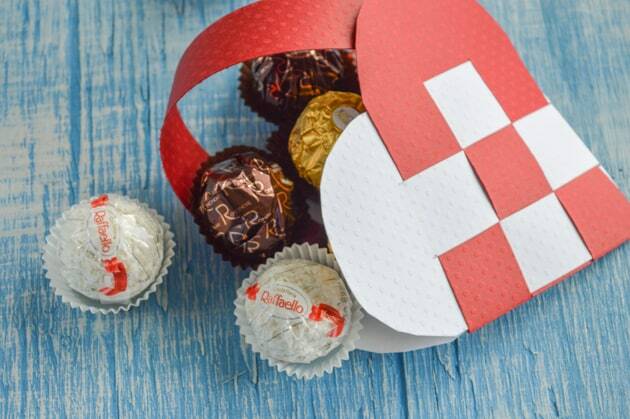 Plus, they’re simple enough that it wouldn’t take too long to make an entire batch of them for a class or a party. 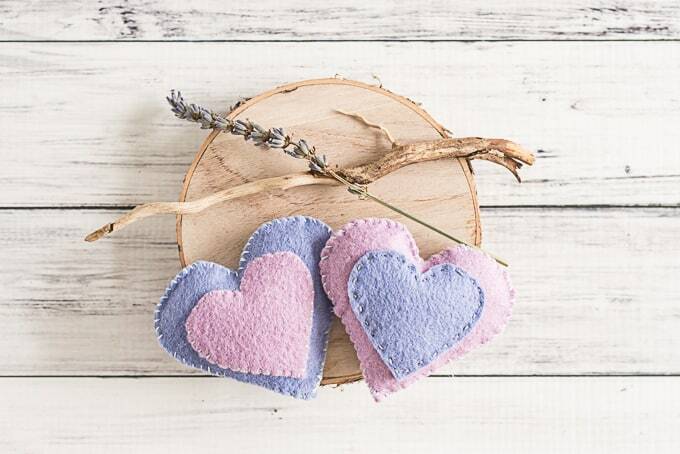 If you’re looking for more heart-shaped crafts, you’ve come to the right place! This is for a Church ” Tea Luncheon” for our woman’s ministry. We are responsible to decorate a table for 8 with a theme of hearts. I hope you enjoy the luncheon and decorating for it! These are so cute – thank you for the template! 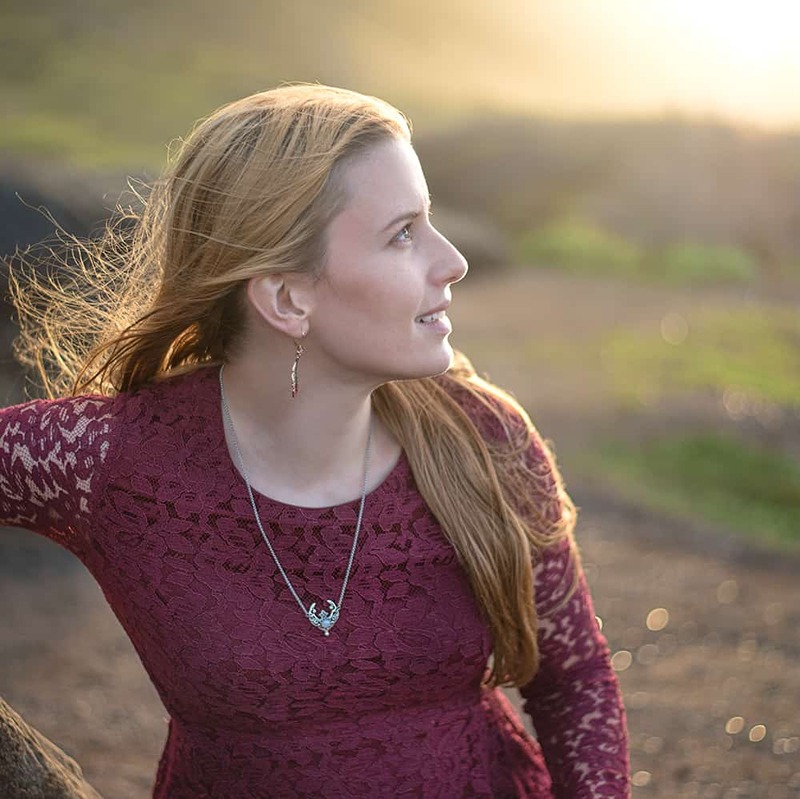 Think this is a great project for me and my oldes granddaughter!